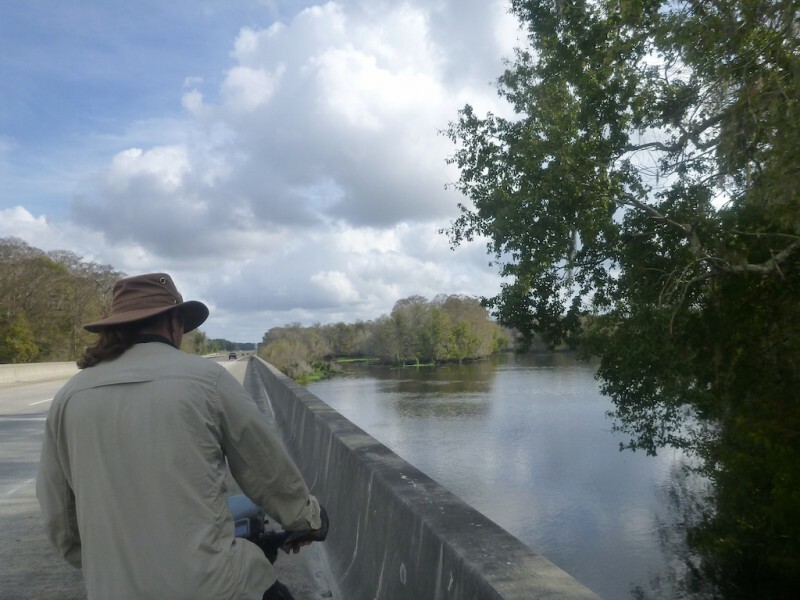 04 Jan Our first Florida Bike Tour of 2016! 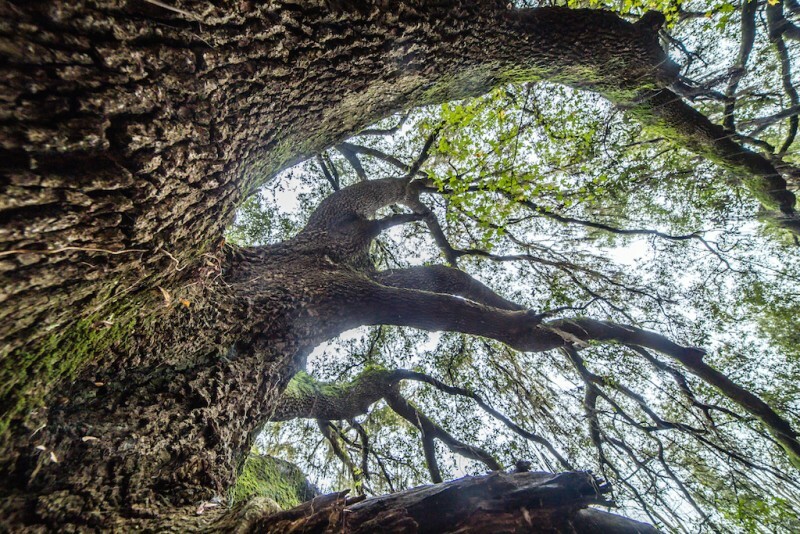 While some people would rather sit at home with family and friends, a glass of bubbly and watch the ball drop, we enjoy hitting the road and going into the woods. Although, we do like spending time with friends and family, we also really miss bike touring. So, what better way to start the year!? 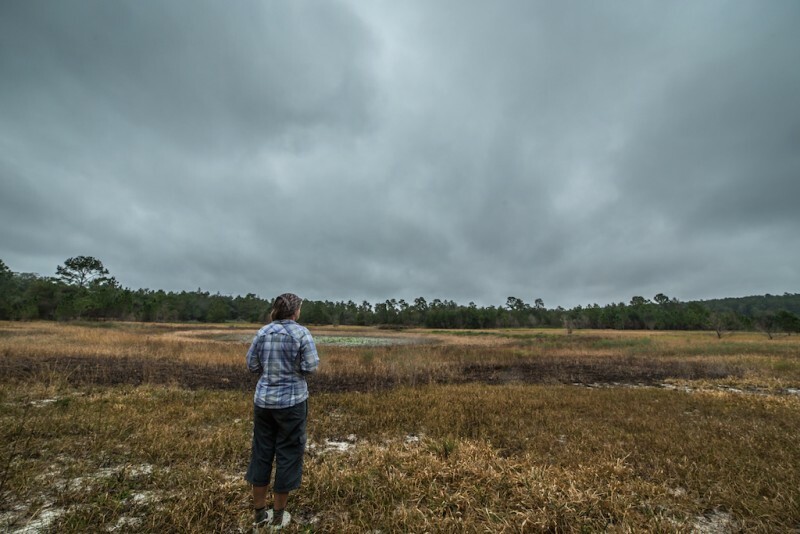 …and yes, we’ve seen the weather forecast, but we are optimistic and we obviously did not think, the weather was going to turn out this nasty. 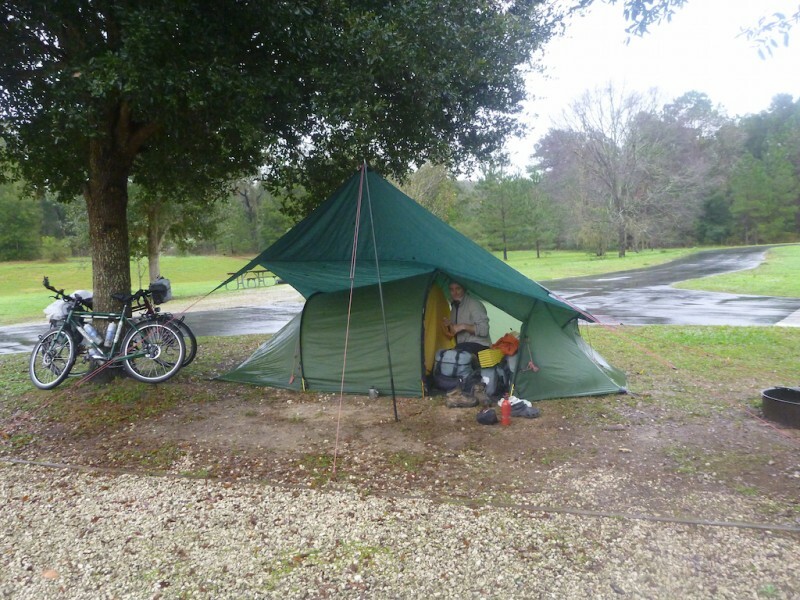 As New Year’s Eve arrives, we pack our bikes and camping gear into the car. 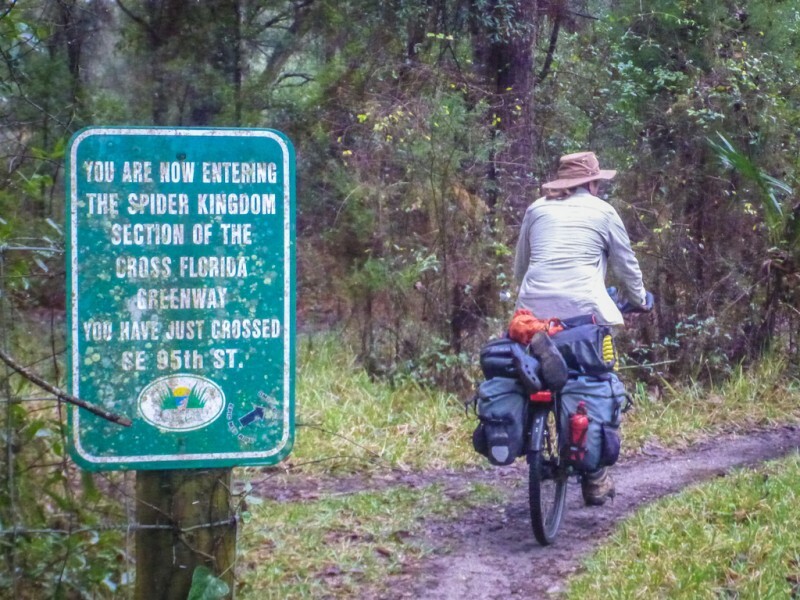 We drive an hour or so to the “old” Florida in the North, to spend the next few days cycling about. We’ll be on a mixture of dirt roads, forest roads, single track, and country roads. 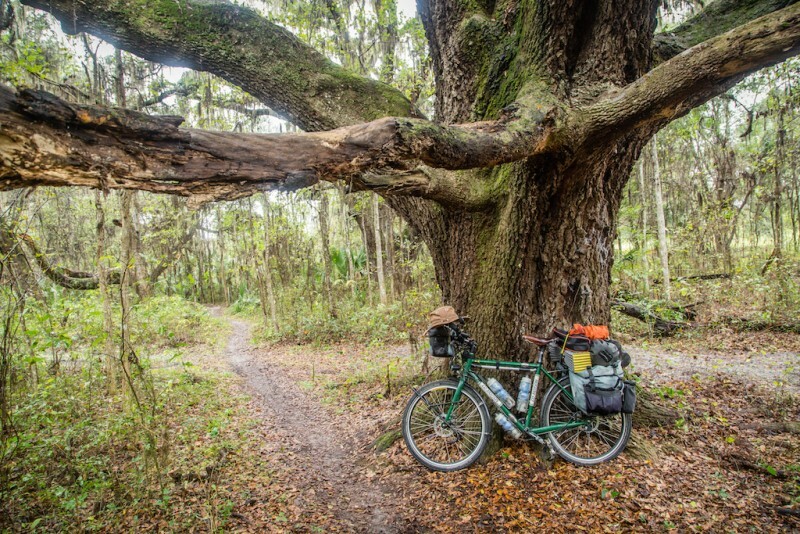 We only have a rough idea of a route, which will take us through the Citrus Wildlife Management Area, from where we’ll head over into the Ocala National Forest. 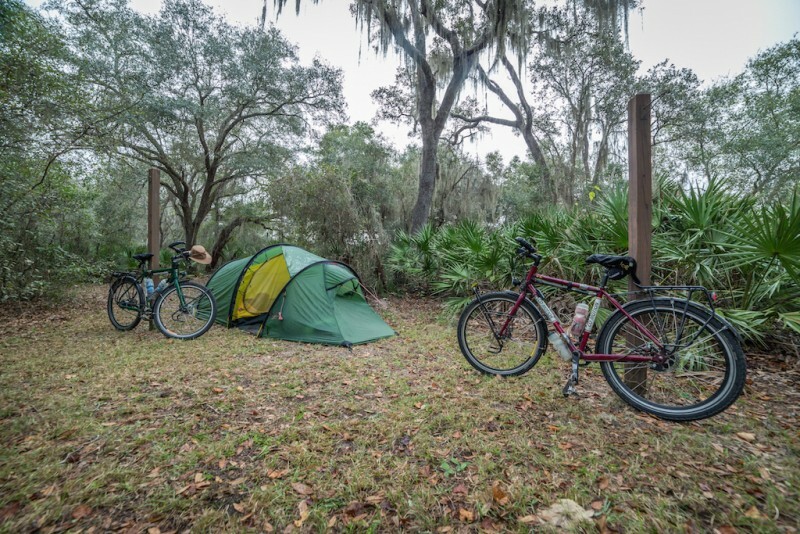 After cycling around there for a little bit, we’ll find our way to Santo’s Campground and Trailhead and then head along the Marjorie Harris Carr Cross Florida Greenway to Citrus WMA again. From our starting point it is only a couple miles into the forest. 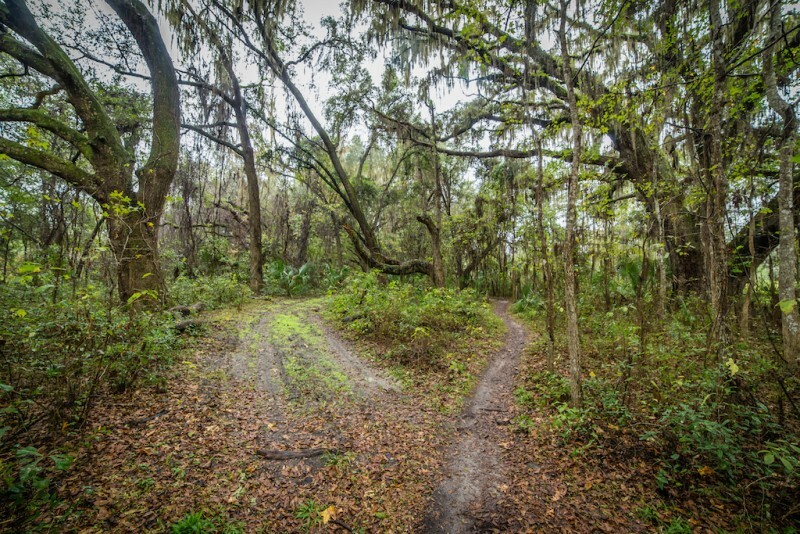 There are several forest roads and trails transversing the huge wildlife management area. Unfortunately for us, most of them have long stretches of deep sugar sand. Not to mention, many of these trails seem to be popular among jeep drivers, which means they also have deep ruts in the sand. 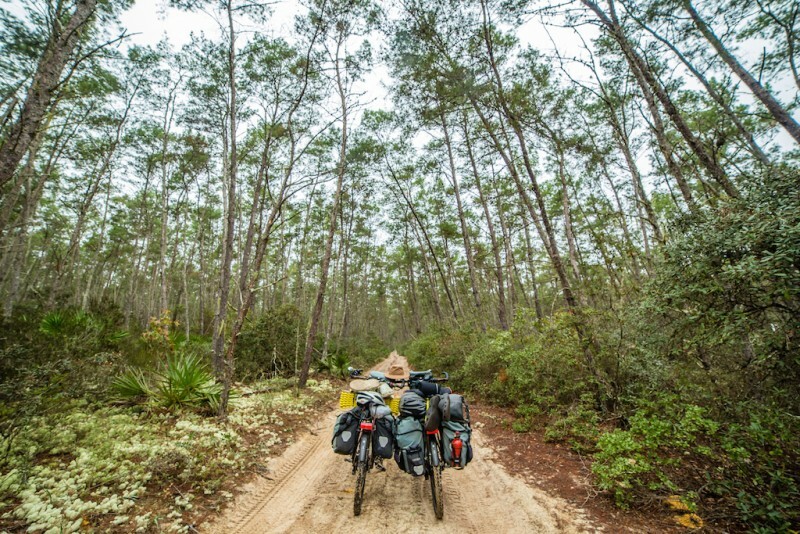 Since only one of us is set up for bike packing on a mountain bike, we decided to take our trusted heavy, steel, touring bikes, which happen to fishtail all over the fine sugar-sand and then sink deep into every track and sandpit. What else are we to do then half push, half ride our bikes throughout the wildlife management area. 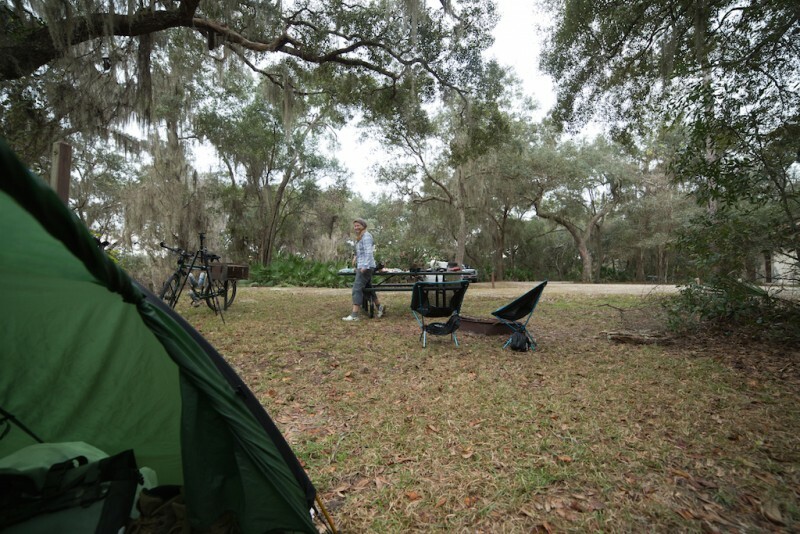 Eventually–and much later then anticipated, due to all the pushing we had to do–we make it out onto country roads and then entered Ocala National Forest, where we spent the night at a quiet little campground. After chatting with the host campers and cooking dinner, we sit by the fire, before crawling into our sleeping bags for the night. The following morning, it already feels much cooler than the day before. We had a few sprinkles hit the tent during the night but now it is just cloudy and dreary looking. That is not enough to stop us from going on another day of adventure though. 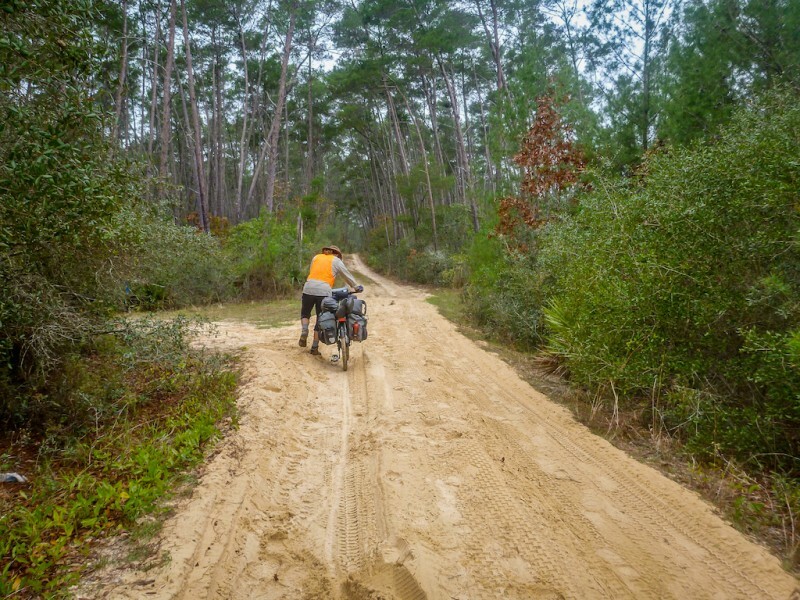 We enjoy a cup of coffee, eat breakfast, break down camp, and hit the dirt roads that are leading further into the Ocala National Forest. Since it is hunting season, we keep our bright vests near by and hope that all the hunting dogs are well trained and won’t give us chase. Luckily, all the dogs are well behaved and busy chasing deer and the hunters are cool and strike up conversations with us. As we ride along the dirt roads, we get to enjoy the scenery. 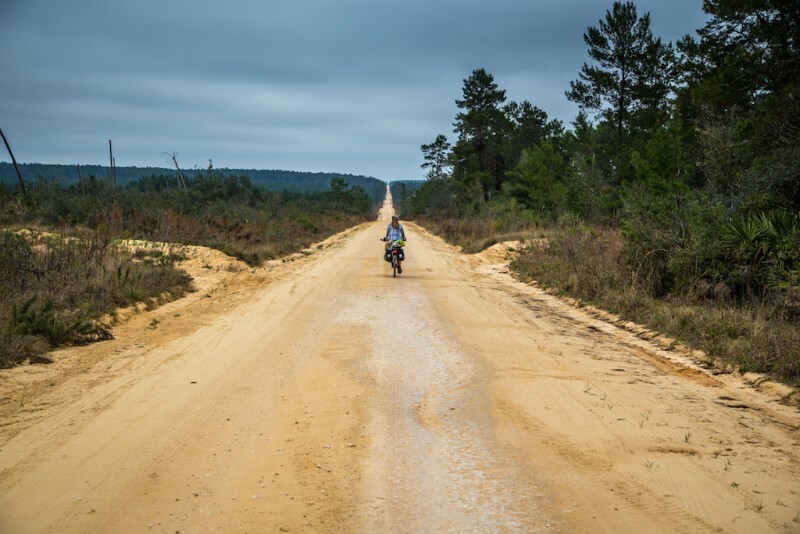 We ride through pine forest and prairies, we enjoy the beautiful vistas as we cycle over rolling hills and we get to push our bikes some more through the thick sand. 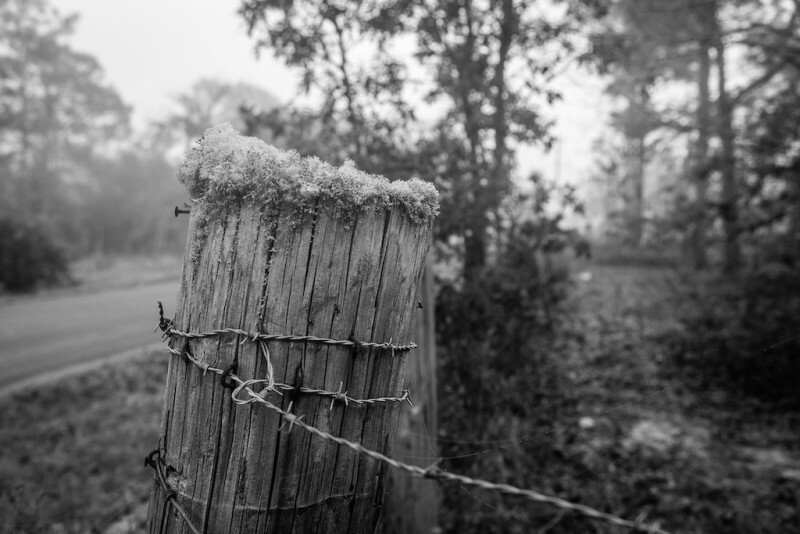 As the day goes on, it seems to be getting colder. To top it of there is a 100% chance of rain for tomorrow, so we change our plan of riding further north and decide to head toward Santos to spend the night. That way, we would be able to ride back to the starting point from there, should the weather get too nasty. We knew it was going to rain all along; however, we did not expect the plummeting temperatures. Since we do not own good rain pants anymore (our last pair were all worn out and we dumped them somewhere in Europe), we figured there is no sense in being cold and wet for two days. 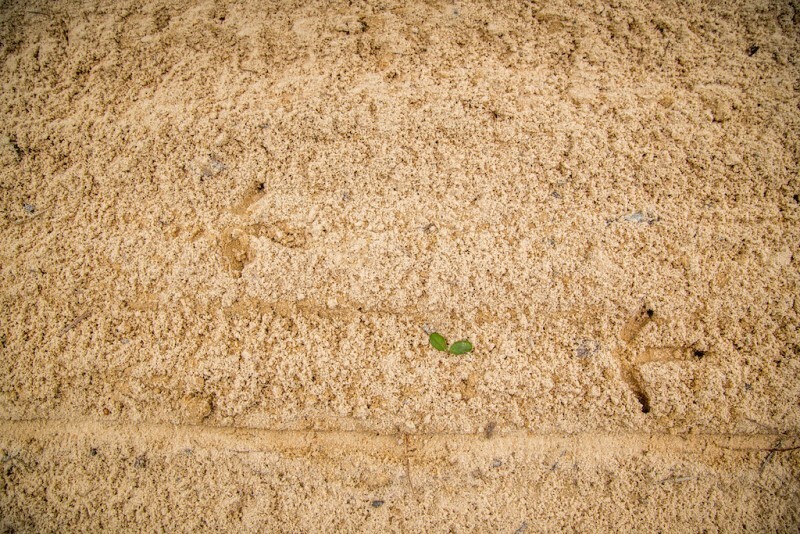 While chatting with another group of hunters, they give us a tip on a route through the forest, which involves less sugar sand and that will lead us toward Santos. To our surprise it leads through a lot more beautiful forest though. We make it to the Santos Campground at night fall, just before the camp office closes, and get the last available camping spot. Looking at the empty sites though, we would have never guessed, that it was the “last available camp spot”. Apparently, the weather is really going to be crappy and most campers have already left to head back home. Not us though. We are setting up camp, take a shower, cook dinner, have a beer or two and eat as it starts raining, and raining, and raining some more. In the morning we get a short break in the rain, which is just long enough to have breakfast and tear down camp. We get talking with our camp neighbor who already packed up everything in the car to get going, but he was curious about bike touring. After exchanging a few stories and other information, it is time to get going again. 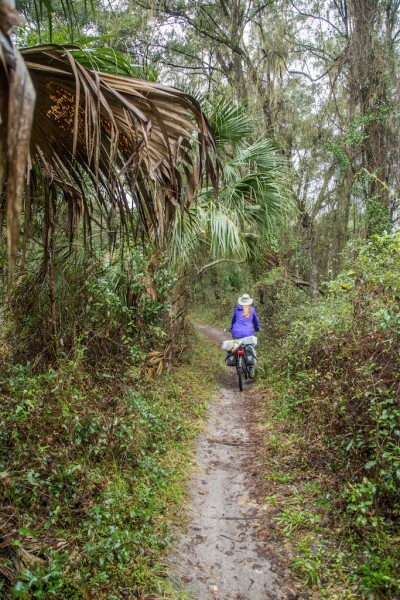 We hit several fun single track paths through the forest until we reach the famous land-bridge. After the land-bridge we take the service road that cuts through the Marjory Carr Greenway. 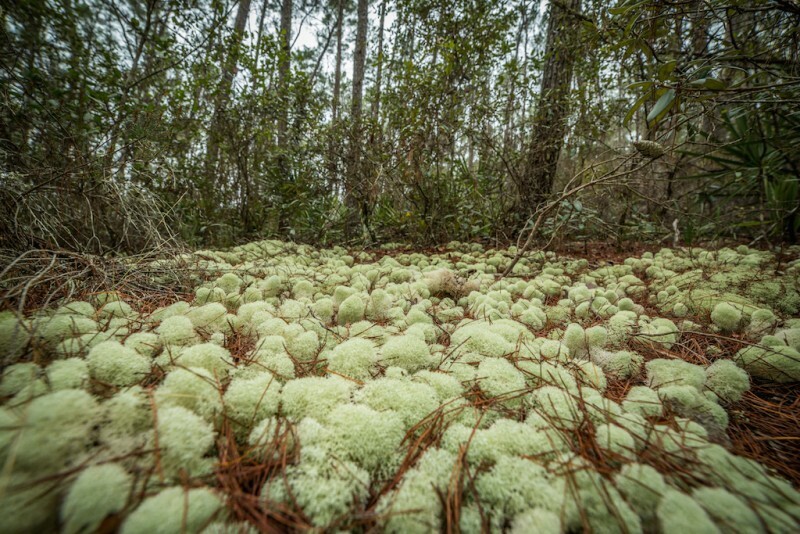 It consists of mostly hard packed dirt, covered in leafs and pine needles, and somewhat slippery limestone. The rain comes in waves and the temps are in the low 50s. One moment we are pulling out our rain jackets, a couple miles down the road we take them back off again because we are sweating, just to stop again a few minutes later to put them back on. We are getting drenched and the cold, wet weather is chilling us to the bones. Our toes are going numb and it is becoming more and more difficult to move our fingers to shift or pull the brakes. Eventually, we find our way back onto country roads. 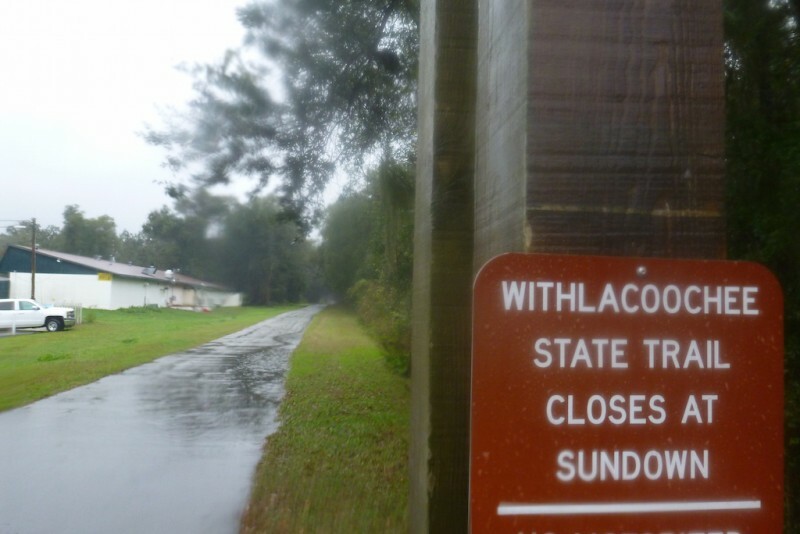 We hit a short stretch of the Withlacoochee Bike Path before getting back on the road again. By now the rain is really picking up and so is the after-holiday-traffic. Not only are we getting rained on from above, we are getting splashed by cars from the side and the road grime is getting us from below. Water is running down our legs and our waterproof boots are keeping every drop of ice cold water securely locked inside of them. Finally, we arrive at our car. 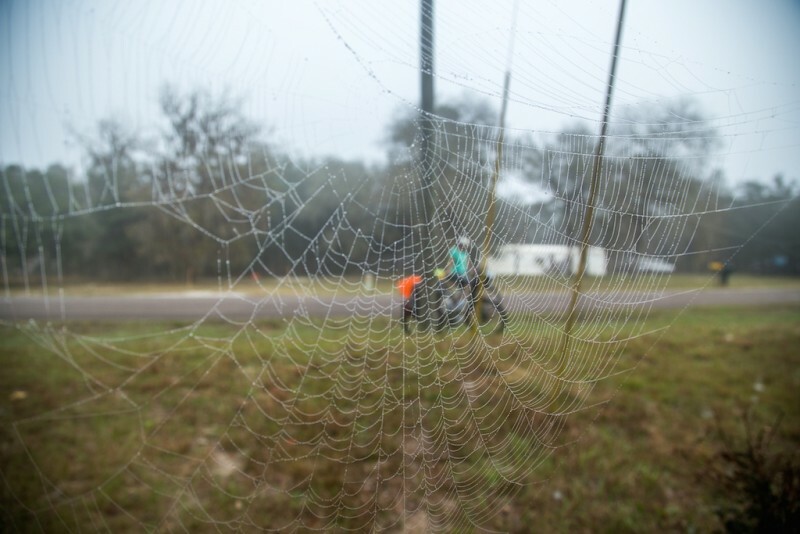 Although, we are drenched and frozen stiff by the time we get there, we are about as happy as can be….after all, we got to spend another few days bike touring and living life to the fullest. Nice photos and write up. 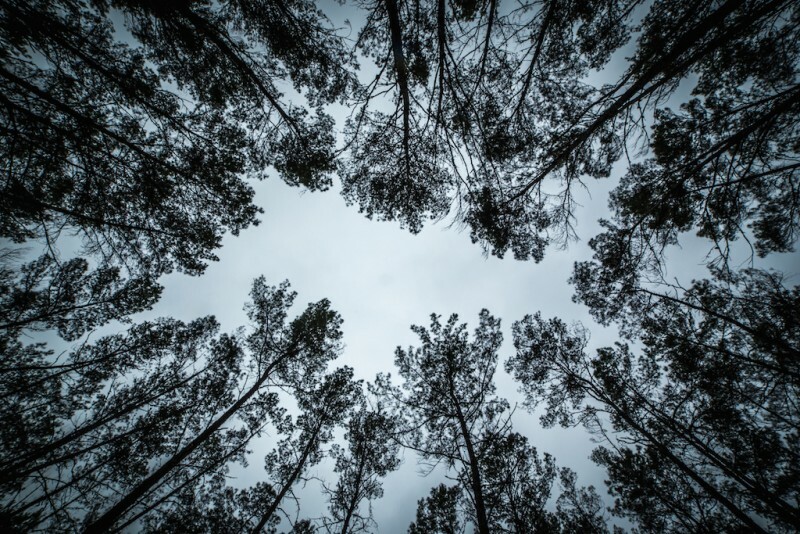 Besides getting wet/cold i think being out in the woods when it’s raining or just after gives you a whole different experience (sounds, feeling and smells). Thank you! Oh for sure, as you already know we really like being out of the house and in the woods. And even though it was raining and cold it still makes for a great time. Not only are the sounds, smells, and so forth different, it also adds a new challenge to the trip. We were not prepared for the sudden drop in temperature, but we survived and will know better next time. What a beautiful state, so nice to see the more rural side of Florida. 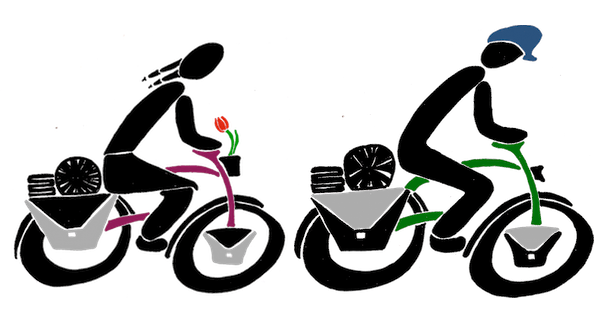 I have an electric bike and I’m just dying to take it on an adventure. All i use it for at the moment is to get me to work and back. Hi Emily. It’s great to hear that you are commuting by bike. Before you know it you’ll be doing some over-nighters. 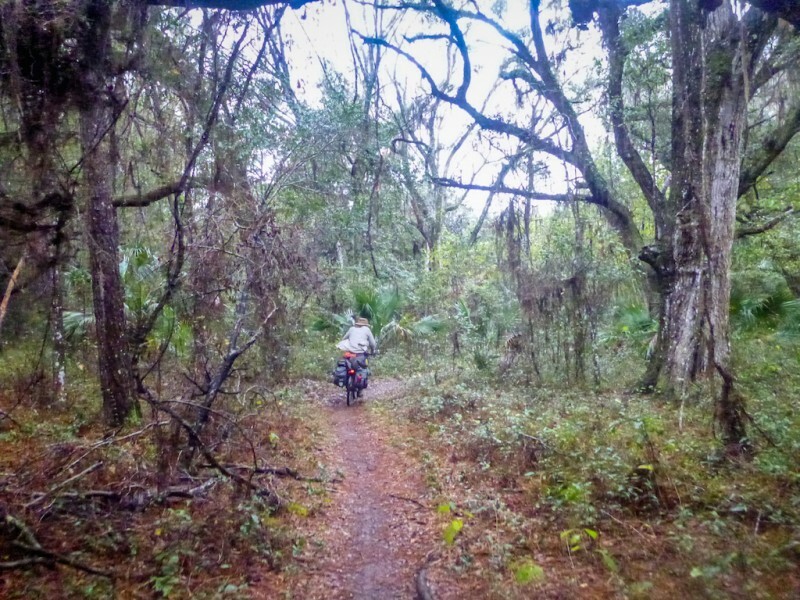 Yes, Once you make it out of the built-up areas, like northern Florida it is actually very nice to cycle through. 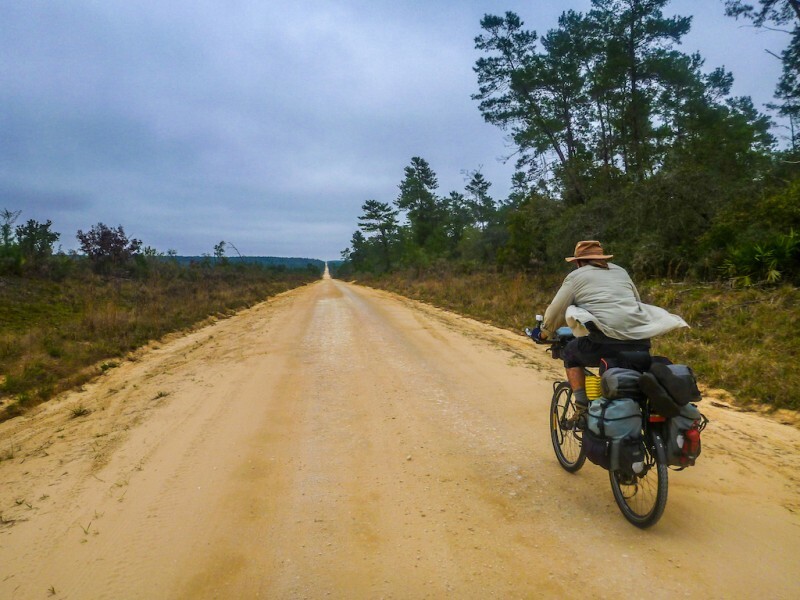 There are plenty of small, quiet country roads with courteous drivers around, that make cycle touring in Florida enjoyable. Also… fellow wanderlust sufferer over here!